They seem to have this idea that keys are one-time-use items that automatically unlock whatever locked door you happened to encounter most recently. Then again, horror game developers also think flashlights drain their batteries in 3 minutes and that otherwise mundane locations are littered with spare batteries, so I don't know what reality they live in. I've found horror games are usually better than most genres about having keys be for specific places. Horror game tropes are just... something. "What madman would arrange a police station like this?" "Well, you see, it wasn’t always a police station. It used to be a museum!" "... What madman would arrange a MUSEUM like this?" Why do game devs do that? Why not, like, let the player figure out on their own where the key goes? Because I'd go crazy looking for keys to everything that didn't open, and get paranoid about missing loot because I never found the right key to the Cellar of Chainsaws and Health Upgrades. This is a cross-section of a level from Hitman 2016, specifically floor 4 of 6. 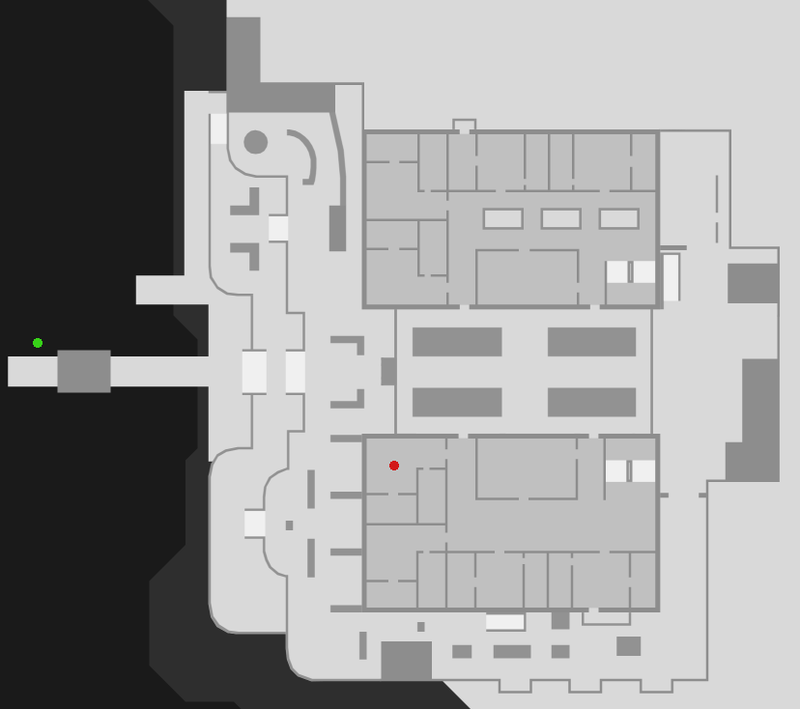 The room with a red dot contains a key that unlocks a boat located at the green dot, on floor 2. Good luck working that one out without the key specifically telling you it's a boat key. Eh, that's in the same level. I mean, I'm going to click on everything and try every item with everything, so it's not so bad. It's the King's Quest "oh-crap I messed up half the game ago" type of thing that I'm worried about. I mean, this is a valid point, but at least include some in-universe justification for why the character instantly knows what the key goes to. Have a tag on the key that says "boat key" on it or something. That doesn't seem especially hard to work out. Like Aliroz said, it's in the same level. I guess the specific scenario I'm thinking of is one that occurs a lot in generic Steam horror games, where you're exploring some area, and you happen upon a generic-looking key asset that looks like it could belong to almost anything, but when you pick it up, text appears reading "BASEMENT KEY" or some such thing. If you're going to tell me what the key belongs to, I at least expect some in-universe justification for how the player character would know this. Make it a particularly distinct key that matches a particularly distinct lock. Make it a key in a specific location that was previously mentioned elsewhere in the game. Or, like I said before, even just adding a keyring with a tag would be something. It'd be lazy as hell, but it'd be better than nothing. But...I'm expecting too much from Steam horror games, which tend to be thrown together from premade assets with little to no thought anyways. Or how about fairies that just act as keys themselves? As you go through the level, you find imprisoned fairies and free them. Each fairy is so happy at being freed, they offer to unlock one door of your choosing with their magic. Once they've unlocked a door, that fairy considers their debt repaid, so they fly away, and you never see them again. There, a justification for why the "keys" can unlock any door, but can only be used once.